Cherry Blossom Festival 2018 - Can we match its success, this year? 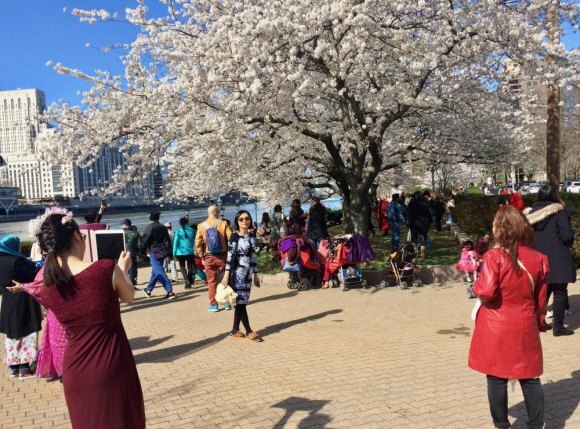 On RIOC's Facebook page alone, 13,000 say they will enjoy the Cherry Blossom Festival on Saturday in Southpoint and FDR Four Freedoms Parks. Another whopping 69,000 declare they're "interested." Unpredictable numbers of others are likely to challenge security and transportation. Are we ready? Music and dance celebrating Japanese culture, following a festival launching Tea Ceremony in Southpoint, entertain in FDR Four Freedoms Park. The conservancy that runs the park's organizing acumen and established professionalism pretty much guarantee a well run show, regardless of crowds, and the J Luce Foundation's substantial, if quiet, involvement reinforces those strengths. But signs of unpreparedness and worse have popped up everywhere else. RIOC President/CEO Susan Rosenthal's casual aside to a resident that the Cherry Blossom Festival is the RIRA Common Council's show should trouble anyone who understands how reliant on RIOC everything outside the park will be. The entire Cornell Tech campus roadway. North Loop Road at the rear of Sportspark (250 Main St). West Roadway north, from Tramway Plaza to 475 Main Street, opposite the turnaround (southern end of Rivercross lawn). All traffic will be diverted to the East Roadway. There will be two event checkpoints, monitored by both the R.I. Public Safety Department and additional security officers to provide added coverage, located at the West Roadway (west of the Tram Plaza) entrance and at the junction of the North Loop and East Loop Roads (at the northeast end of the Cornell Tech campus). These checkpoints will open at 10 AM and be in place throughout the event day. Setting aside RIOC's decades long communication shortcomings, including mind-bending run-on sentences spiced with unpredictable commas, immediate questions come up. First, what about Red Buses? They get no mention, although it appears that they, along with cars and trucks, will be unable to drive south of the Tram Plaza because security checkpoints will block Main Street on both sides. And if the buses terminate at the Tram, what accommodations will be available for those of us unable to make the hike south into the parks? We asked these questions in an email to Rosenthal and key members of her staff: Cy Opperman, Erica Spencer-EL and Jessica Murray, less than an hour after the plans were released. That's right. Bunker mode, the traditional State agency reaction when they're caught with their plans down. So, we don't know and neither do you nor any visitors trekking over on Saturday. Does RIOC have a plan? We'll see. And if they've got one, why's it a secret? And just for the record, RIOC's got the subway wrong again. "F train subway service and both Tram cabins are expected to be in operation throughout the Cherry Blossom Festival," RIOC confidently added. "In addition, regular Ferry and MTA bus service will be available to and from Roosevelt Island." In fact, there will be no F Trains in either direction for Roosevelt Island, this weekend. A peculiar twist, though, mitigates the problem because we get E Trains in both directions instead. The E's detour, after 63rd and Lex, to the R Line should not pose a major problem for Roosevelt Islanders, but what about 10,000+ planning to come here on Saturday? They'll find no Fs or any other trains covering Sixth Avenue. Fs are running on the E Line. (See, I told you it was peculiar.) So, in order to get here, if not boarding at 63rd and Lex or 21st Street in Queensbridge, you'll need to make your way over to Broadway, where the E will be doing an R before going F for Roosevelt Island. I guarantee you RIOC doesn't. And will the Tram suddenly begin operating both cabin on Saturday? Really? Storm Warnings for the Common Council? The weather is likely to be okay, in the 60s and 70s and probably just cloudy, with not enough of a rain threat to dampen the fun. But the Council's ongoing turmoil over Cherry Blossom Festival mismanagement reaching a fever pitch, this week, may signal trouble as a disgruntled group within the ever shrinking Council expressed frustration with the absence of promised details from President Lynne Strong-Shinozaki and Festival organizer Lydia Tang. With information considered either inadequate or completely lacking, Frank Farance reached out to an insurance broker who Tang said agreed to cover the event with insurance. While a certificate of coverage has not been made public, it does not appear that the out of town insurance agent has a full grasp on the size of the event or its physical circumstances. And as Farance discovered, the broker does not appear to have a license to sell in New York State. Strong-Shinozaki and Tang have turned away requests for details, but if appropriate insurance is not in place, can RIOC or anyone else host the event?